One of the 25 protesters arrested for blocking the westbound lanes of the Bay Bridge last night says the demonstration "was beautiful" and it was "a way to inspire people." SAN FRANCISCO (KGO) -- A demonstration on the Bay Bridge caused a major headache for driver Monday evening. Two dozen protesters shut down all the westbound lanes. Though the demonstrators were all arrested, they were all cited and released late Monday night to applause and hugs from supporters. It is now up to the San Francisco district attorney to decide what the formal charges will be. That process will play out over the next couple of months. "It was beautiful," said Thea Matthews. Matthews was one of 25 protesters who were arrested after taking part in a Martin Luther King Jr. Day demonstration that shut down much of the Bay Bridge. The group chained themselves and five cars together, effectively blocking all westbound lanes. "We understand that it was an inconvenience," she said. "But so was 400 centuries of white supremacy. And so it was a way to disrupt business as usual, disrupt the complacency around the systemic oppression that exists and the constant terrorism on black people." It was a holiday, but the demonstration left thousands of motorists stranded and caused a traffic backup that extended for miles. "What has to happen has to happen and everybody has their reason to protest," said motorist Eric Barfield. "I think it's kind of dangerous to do it on the highways." 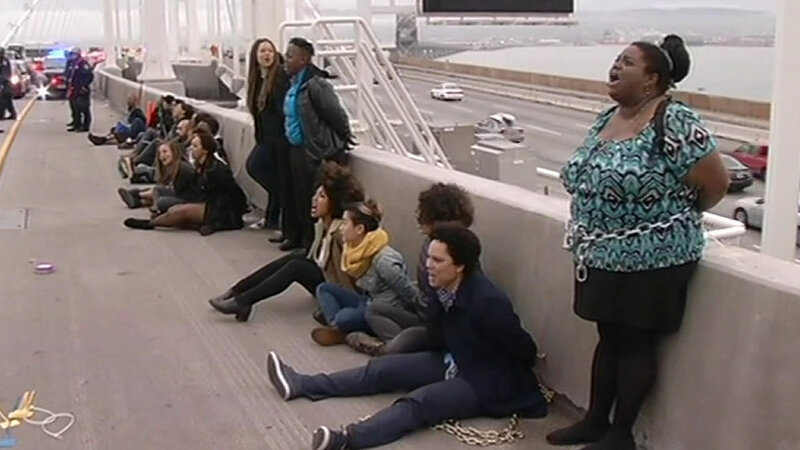 Twenty-five protesters were arrested for chaining themselves together and blocking all westbound lanes of the Bay Bridge during Monday's evening commute. It was part of a series of actions for Martin Luther King Jr. Day. The CHP arrested Matthews and her fellow protesters on a host of charges including false imprisonment, public nuisance, unlawful assembly, and obstructing a free passage. They were all cited and released with a future court date.